OOOKAY THAT WASN'T UNCOMFORTABLE VIEWING AT ALL. basically imagine watching ERASERHEAD while suffering PTSD and dying of a heroin overdose. This movie is pretty fucked up, and not easy to forget. The soundtrack. One of my favorite bad movies. The editing and camera work leave something to be desired, and the acting ranges from bad to serviceable, but throughout it all I sensed the sincerity behind it. Especially impressive was the script - I really believed the main character's psychosis and anguish, and the unfolding of events near the end floored me and left me shaken. Pretty grim stuff. Technical flaws aside, this is a solid movie. A day in the Skid Row life of a scruffy Vietnam vet with no money, no job, a nagging wife and debts to the local mafia. He shuffles around the blasted city landscape, interacting with various lowlifes and slipping in and out of flashbacks of his time as a POW. Not a terribly original movie, but this flick has a powerfully depressing atmosphere...it just oozes grime and desperation and decay. Bonus points for the mutant baby puppet and the creepy music. Totally amateurish one-guy-and-some-family-members production, but there's just something endearing about its creative spirit. 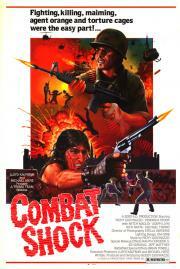 Uncharacteristically for Troma, Combat Shock kind of tries to be serious, despite the paper-machet freak baby. And underneath the low-budget exploitatation-horror scenes, it isn't bad. It's a dark and meditative film. There's no telling how good this might have been if the directing and acting weren't unskilled, and if the music and visual effects weren't comical. A down and dirty film that isn't afraid to go where others will not tread, Combat Shock is a film that is hard to watch and harder to forget. The acting isn't the greatest, but the atmosphere is excellent. Don't go in expecting an action film, as the DVD cover suggests. This is more akin to something like Jacob's Ladder or, to a lesser extent, First Blood. It's about the decaying society that Vietnam vets returned to, and it's filled with memorable images. Music is pretty solid as well. Campy, but not in the good way. Not a good film, but there are infrequent flashes of power in this tale. Eraserhead with the existensial angst replaced with posttraumatic stress disorder. Giovinazzo may be as earnest as Lynch, but it's horseshit. Super low budget Vietnam vet war movie that has a completely bizarre deformed baby in it. This indie film is just so strange that you have to see it at least once. The low budget 80's actors are also pretty hilarious. The story is completely bleak but the director does achieve an interesting surreal quality to his film even if it is objectively bad in every other way. The atmosphere and mood created here are by no means original, but they are not easy to scrub off. If you can get past the comically low-budget trappings, you'll find a reasonably well-crafted and directed film with a handful of quietly brilliant shots. Ignore the idiotic Rambo-esque DVD cover and any other indications that Troma had their "creative" claws in the film; for a "bad movie", it's really not that bad. Essentially a mix of Taxi Driver and Eraserhead, but its cheapness, gritty setting and scuzzy amateurishness works in its favour.